22nd Annual Casino Night - Sponsored by the Smithville Area Chamber of Commerce. This annual event features gaming (with $10,000 in chips included) a BBQ dinner by Zimmerhanzel's, drinks, raffle and more. This fundraiser benefits the many Fall events sponsored by the Chamber. 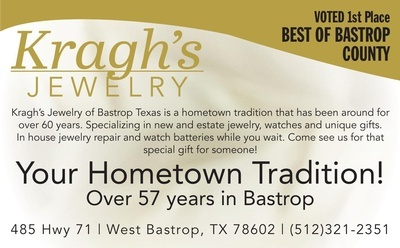 Kragh's Jewelers & Ladds Coin & Jewelry. Register online or call the Chamber for details (512) 237-2313. ​Several sponsorship opportunities available as well.